The Grey House is one of a series of canvases painted by Chagall in his native city, Vitebsk, during the First World War. In this view of the old town—whose recognisable landmarks include the steeple of the Cathedral of the Assumption—the central feature is the wooden house in the foreground, typical of those found along the banks of the River Dvina. Here, Chagall blends the Cubist techniques learnt during his Paris years—varying planes and shifting perspectives—with fantastical elements such as the sinuous clouds and the small figure on the left, which might be a self-portrait. These elements, together with the predominance of grey, convey Chagall’s perception of his native city as ‘sad and gay’. In the summer of 1914, after passing through Berlin where his work was shown at Herwarth Walden’s prestigious Der Sturm gallery, Marc Chagall returned to his home town, Vitebsk. Although he intended to go back to Paris after a short stay, the outbreak of the First World War, followed by the Bolshevik Revolution, forced him to remain in his country until 1922. The powerful contrast between the high spirits of the Paris avant-garde and the quiet life in provincial Vitebsk, which Chagall described in his autobiography as “sad and gay, ” brought about a transformation in his painting. 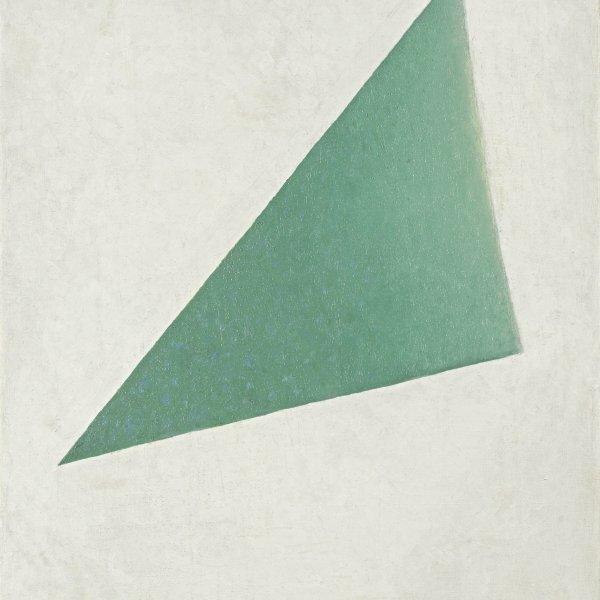 During the six years he spent in this small Jewish town before moving to Moscow, he painted a series of pictures — which he called “documents” — on its peoples and landscapes. Among them is a set of views of the town in which Chagall, with his own particular lyricism, combines contrasting feelings, sometimes idyllic, sometimes nostalgic or apocalyptic, in reaction to the happiness his recent marriage brought him or the emotional tension of the Bolshevik revolution, in which he played a very active role during the initial years. 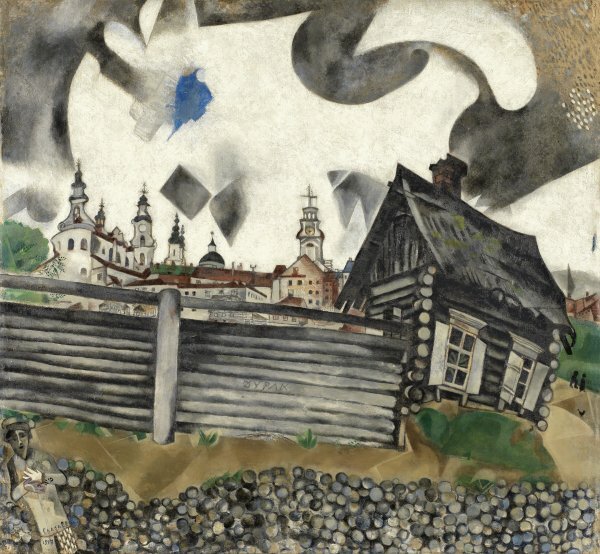 Chagall shows us the churches and humble homes of his fellow countrymen and makes Vitebsk the idyllic town above which his beloved wife Bella hovers in The Promenade, executed in 1917, or the gloomy, apocalyptic place depicted in this painting in the Museo Thyssen-Bornemisza, dated the same year. In The House in Grey the artist depicts Vitebsk in a fairly naturalistic manner, albeit with certain elements taken from Cubism. Chagall immortalises his town, with its Baroque cathedral of the Assumption looming above the houses in the old part and, in the foreground, a typical wooden hut of the many that lined the banks of the river Dvina. The unreal perspective with which the cabin is painted and the interplay of the various planes recall Cubism, while the sinuous sky, which appears to stir up the entire composition with its movement, give the scene a somewhat fanciful and oneiric appearance. Both the solitude of the small hut, which appears abandoned, and the gesture of emotion of the mysterious figure to the left of the painting, with his hand on his chest, convey a feeling of nostalgic sadness. John Bowlt and Nicoletta Misler believe that this enigmatic person sheltered in the lower corner of the painting with the name “Chagall” inscribed on his jacket is a self-portrait. These authors furthermore stress the fact that the other two inscriptions on the painting (Marc in Hebrew on the person’s shirt sleeve, and the Russian word durak on the wooden fence of the house, which means “idiot”) suggest that Chagall is endowing the painting with a double meaning — “Chagall is an idiot” or, more colloquially, “Chagall is the village idiot”— and relate it to the taste for the vulgar which he sometimes shared with other Russian artists of his day.